Thereʼs so much anticipation brewing at Alpine Valley Music Theatre as the rumors have been confirmed to be true! 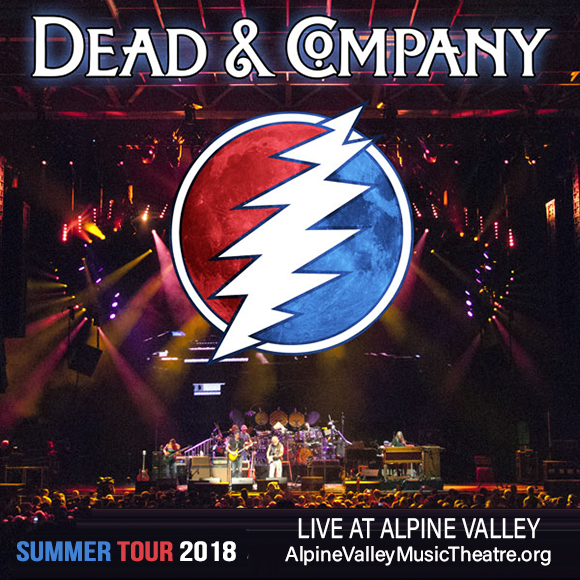 Dead & Company has announced it is coming live to Alpine Valley Music Theatre and you can grab the chance to be there! Book here for tickets to Dead & Company on Saturday 23rd June 2018! Throughout their long standing career – Grateful Dead and their passion to continue the music on, Dead & Company was born. With the help from one of their biggest fans, John Mayer, they were convinced to begin a new project under the branch of the group. Now he has joined the remaining Grateful Dead members Weir, Hart, and Kreutzmann formed the band, along with keyboardist Jeff Chimenti and bassist Oteil Burbridg – all take to the road to do what they do best, in a captivating live performance! Dead & Company started to tour in the Fall of 2015 and announced their first show to take place in Madison Square Garden, with this performance, it was just a small matter of time before they grabbed the attention from their fans, across North America and worldwide and they realised that this magical showcase must continue. Each year they travel across the country and stop off along the way to give the people what they want. With Grateful Dead hits and new material, these guys are a sensational group to see live in concert. There's nothing like seeing legendary artists perform! And as John said he "will never close the door on Dead & Company, ever." and Weir described his experience as a "cosmic, out-of-body vision" he had, and a subsequent dream, of the band continuing for decades." Coming LIVE this summer is Dead & Company – you'd be crazy to miss this once in a lifetime concert, there's nothing quite like a legendary act!